A quick note from this past week. On Sunday, July 26, "Cheers to You," a show that features craft brewing and related info in Bucks County, was at Pennsbury Manor for a feature on their historic brewing program. We'll let you know when and where the show is available; it should be sometime this fall. And now, without further interruption - your feature presentation. Aug. 1-2: 252nd Anniversary of the Battle of Bushy Run—there are two battle reenactments (morning and afternoon), so you can learn about the events of August 5-6, 1763, all in one day. You'll also find military camps, period craftspeople, and food vendors at this annual event. (To read more about the anniversary, check out a post from 2014 on the Pennsylvania Historic Preservation blog.) Admission is $5. 10 am-4 pm. UPDATE: Aug. 30: Bushy Run Picnic at the Battlefield—bring your own picnic or purchase food from vendors on site. There will be live music, children's activities, and a leather-working class. The picnic is free; regular admission fees apply if you wish to visit the museum. Noon-5 pm. Expanded Summer Schedule: Site open Wednesdays and Saturdays, 10 am-4 pm; Sundays, noon-4 pm. Aug. 2: Living History Sunday—learn about life in Berks County in the mid-18th century. Noon-4 pm. Aug. 7: Blast!—this event features local breweries and wineries (see full list on the website), music by the Wayne Fox Trio, and (new this year!) a pig roast with all the trimmings. There will be “soft” refreshments (including root beer) suitable for designated drivers and folks younger than 21 (you must be at least 18 to attend this event). Advance tickets are $40; designated driver and under 21, $25. On the day of the event, tickets are $45 ($30 for DDs and under 21). Advance tickets may be purchased at the furnace or by calling 717/272-9711 to charge by phone. 6-9 pm. Aug. 11: Lecture—Wendy Looker's topic will be "The History and Mystery of Mary Ann Furnace." Part of the Friends of Cornwall Iron Furnace lecture series, the program takes place in the auditorium of Freeman Community Center at Cornwall Manor. 7 pm. Aug. 2, 9, 23, 30: Interpretive Sundays—spend Sunday afternoons in August learning about gunsmithing (8/2); blacksmithing (8/9); clothing and textile processing (8/23); and basketmaking (8/30). Included in regular admission. Noon-4 pm. Aug. 5, 12, 19, 26: Sawmill Operation Days—subject to staff availability, there will be demonstrations of the site’s water-powered sawmill. Free of charge (admission rates apply to visit the historic area and the homestead). 11 am & 2 pm. Aug. 15-16: Battles at Boone—learn about 18th-century military and home life, including battle tactics, medical care, and trades. More details, including a list of participating units and sutlers, are on the website. Admission is $10 for adults, $8 for seniors, and $6 for children; food will be available for purchase on-site. Aug. 8: Something More Saturday—Today's theme is "Oil Past and Present," with family activities and fun. Included in regular admission; special family rate of $20 for up to 2 adults and 3 kids. 10 am-3 pm. Aug. 22: Drake Day Circus—the oil boom era comes to life with jugglers, fire-eaters, music, and acrobats. Included in regular admission; special family rate of $20 for up to 2 adults and 3 kids. 10 am-4 pm. Aug. 29: Oil Valley Blacksmiths Association—this monthly event brings local blacksmiths to the site to show how it’s done. Included in regular admission. 10 am-2 pm. Aug. 15-16: Civil War Weekend—learn about soldiers' experiences and life on the homefront through encampments, demonstrations, presentations by the Eckley Players, and musical entertainment of the Civil War era. EMV's website has the details. Admission charged. 10 am-5 pm. Aug. 2: Ice Cream Social—ice cream (courtesy of Turkey Hill and dipped by WGAL's Jere Gish) and music (award-winning banjoist Conlan Kerschner) in a beautiful setting. Tickets are $4 and may be purchased at the Museum Store. On Central Penn Parents list of the Top 5 things to do this weekend. 1:30-4:30 pm (ice cream is "all-you-can-eat" while supplies last). Aug. 11-14: Colonial Summer Camp—for ages 6-12 (children will be divided into groups age 6-8 and 9-12). Hands-on activities, role-playing, arts and crafts are on the agenda while students learn about life at the Ephrata Cloister. Cost is $125 ($100 for members of the Ephrata Cloister Associates). Call 717/733-6600 to register or go to the camp page on Eventbrite. 9:30 am-1 pm (snack break 11-11:30). Aug. 11: Erie Gives—on behalf of the museum and ship, the Flagship Niagara League is participating in this year’s community-wide online fundraising drive. Your donation (minimum $25) any time between 8 am and 8 pm on August 11 will be stretched by the Erie Community Foundation. Go to www.eriegives.org and search "Flagship Niagara League." Aug. 1, 8, 15, 22: Saturdays at the Fort—Aug. 1, Living History: Fife and Drum; Aug. 8, Living History: Artillery; Aug. 15, Living History: Cooking; Aug. 22, Living History: Timber Framing. 10 am-4 pm. Aug. 15: Women's History Seminar—for full details on the topics and speakers visit Fort Pitt's website. Included in museum admission. 11 am-5 pm. UPDATE 8/14/15: Program date has been changed to Dec. 12 Aug. 23: Living History Theater—"Elizabeth Graeme's Loves and Losses" features special tours of the Keith House, where visitors will encounter scenes from the life of Elizabeth Graeme Fergusson and her contemporaries. Light refreshments will be served in the visitor center. Admission charged. 1-3 pm (tours approximately every half hour). Noon-4 pm. Aug. 5: Movie Night—bring a blanket or lawn chair and settle in to watch Unbroken, the story of Olympic athlete and WWII POW Louis Zamperini. Presented by Whitemarsh Township Parks and Recreation. Admission is free. Starts at dusk (about 8:30 pm). Aug. 16: Site open—enjoy the grounds and take a guided tour of the mansion. Admission is $5 (age 18-59), $4 (age 6-17 and 60+), FREE for Friends of Hope Lodge members and visitors age 5 and under. 12:30-4 pm (tours at 1:00 and 2:30 pm). Aug. 2: Oxygen Day—in honor of Dr. Priestley’s best known scientific contribution, this program features costumed docents throughout the house (which includes what may be the first laboratory in America) and chemistry demonstrations. Special guest "Benjamin Franklin" will also be on hand. Admission is free. 1-4 pm; chemistry demos at 1:30 and 3 pm. Aug. 4: Hands-On History Day—experience chores, games, and crafts from the past, take a wagon ride, and learn your lessons in the one-room schoolhouse. Cost is $10 per person (FREE for Landis Valley Associate members and kids age 5 and under). 10 am-3 pm. Aug. 8: Tales, Legends, and Lore—a full day of storytelling around the site, plus hands-on activities and wagon rides. Admission charged. 10 am-4 pm. Aug. 16: Henry K. Landis Birthday Party—come celebrate the birthday of one of the museum's founders and learn about life in Landis Valley the year he was born, 1865. Be sure to visit this year's Visitor Center exhibit, "1865: Lancaster County at the Close of the Civil War." Don't miss out on the birthday cake. Admission is FREE. Noon-4 pm. Saturdays: 19th-century Trades and Other Topics—glimpse life and work in the 19th century through demonstrations and tours - natural history (8/1); blacksmithing (8/8); breadbaking and cooking (8/15); niceties and necessities (8/22); woodworking and children's games (8/29). Included in regular admission, so please start at the Visitor Center. 11 am-4 pm (site open 10 am-5 pm). Aug. 6: Lecture—Eileen Aiken English will present a talk entitled "A Harlot in the Harmonie?" 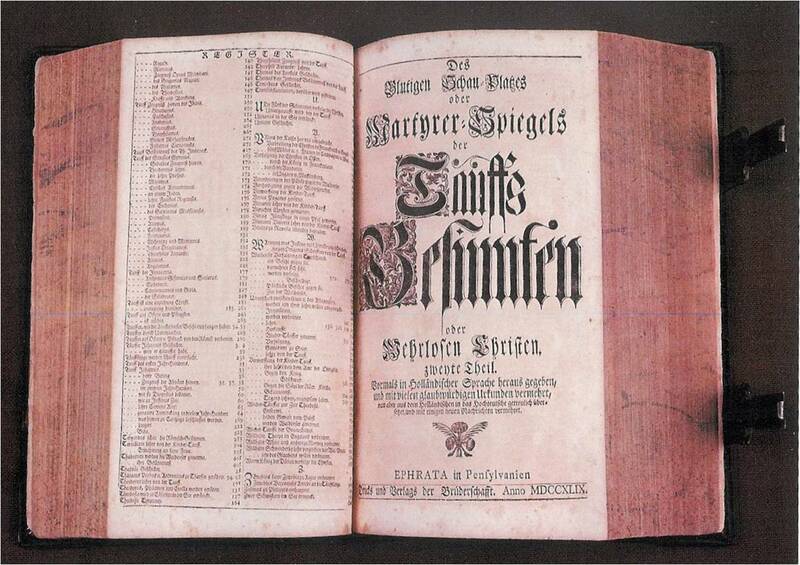 exploring the life and times of Harmonist Hildegarde Mutschler. She will also sign copies of her book on the same topic, which is available for sale in the Village Rose museum store. The program is free and will be held in the Visitor Center classroom. 7 pm. Aug. 9: Site Open—Old Economy Village is open the 2nd Sunday of each month, noon-4 pm. Aug. 2, 9, 16, 23, 30: Special Sunday Programming—Aug. 2, Historic Trades; Aug. 9, Living History Theater, "The Germantown Protest of 1688," exploring the first documented protest against slavery in America; Aug. 16, Open Hearth Cooking, "A Bountiful Harvest," cooks will prepare their favorite recipes using produce from the garden; Aug. 23, Garden Highlights and Beer Brewing Demonstration—enjoy the garden in summer and stop by the brew house, where they'll be brewing Welsh Ale; Aug. 30, Animals at Pennsbury, meet the furry and feathered residents of Pennsbury. Sunday programs are included in regular admission. 1-4 pm. Aug. 4: Central PA Civil War Round Table Series—"Military Ballooning and the American Civil War," with speaker John Augustine, explores Thaddeus Lowe, chief of the U.S. Army Balloon Corps, technical developments of ballooning, and the use of balloons in the 1862 Peninsula Campaign. Donation requested. 7 pm. Aug. 5: Friends' Richard Koontz Memorial Lecture Series—"General Stilwell's Burma Campaign," with speaker Dr. Jon Diamond. Donation requested. 7:30 pm. 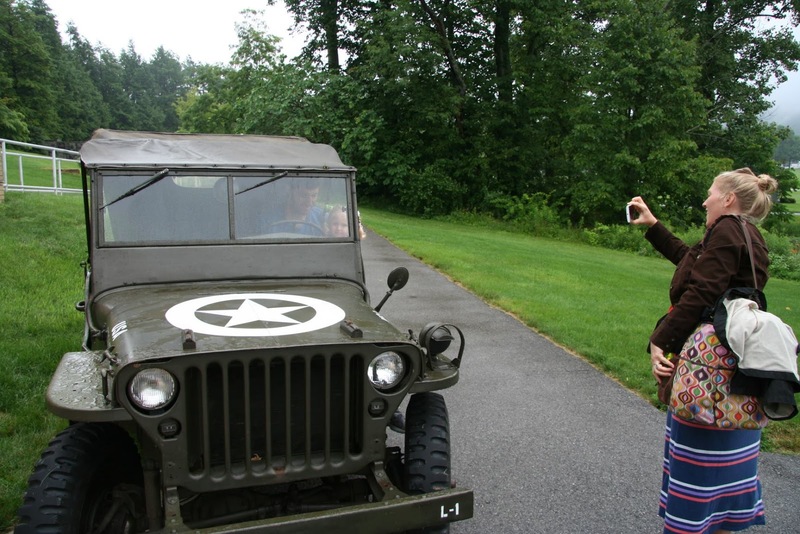 Aug. 15: Kids' Day III, Dress Up & Discover—kids and their families can try on military items from the education collection and sit in a WWII or Korean War era jeep. Photo ops galore. Included in regular admission. 10 am-3 pm. Aug. 22-23: Model Railroading Day—model train layouts from numerous railroading clubs will join the museum's layouts for a weekend of family fun and learning. There will also be clinics and workshops offered (watch the museum website for further details). Included in regular admission (clinics/workshops may be extra). 9 am-5 pm. Wednesdays and Thursdays (plus Fridays 8/14 and 8/28): Nature Lab—a variety of presenters will share their expertise as visitors explore the museum's Nature Lab. Included in regular admission. 1-1:45 pm. Thursdays: StoryTime in Curiosity Connection—staff and volunteers read a different book each week, selected with children ages 3-5 in mind, and then direct a related play activity. StoryTime is included in regular admission. 10 am. Fridays: Learn@Lunchtime—the museum offers free admission from 11:30 am to 1 pm, along with talks by varied presenters. 11 am-1:30 pm (presentations start at 12:15 pm). Aug. 21: 3rd in the Burg—"Artist's Conversations" shines the spotlight on the 2015 Art of the State Exhibit, presenting Catherine Prescott, 2015 Awards Juror (and 2014 Purchase Prize winner), talking with Michael Allen, this year's first prize winner for Work on Paper. Admission is free. 5:30-7:30 pm. Saturdays: Weekly Farmers Market—vendors set up near the intersection of River Rd. and Rt. 532 (or the Visitor Center parking lot when it rains). 9 am-1 pm. Aug. 17-21 & 24-28: Summer Camps—designed for children in kindergarten through grade 5, the week-long camps, which run from 9 am to 4 pm, provide a range of hands-on activities, games, and skills. Cost for a 1-week camp is $200 per child, $350 for two. For more information or to register, contact Jennifer Martin, 215/493-4076. Aug. 28: Films at the Farmstead—a family-friendly movie night under the stars at the Thompson-Neely House and Farmstead. Tonight's feature is Brave. Admission is $5 (age 5+); please bring a blanket to sit on and feel free to bring a picnic. Popcorn and other concessions will be available for purchase. 7-10 pm. Activities continue apace as the summer doldrums make their appearance. (Well, lah-di-dah.) Why not enjoy a nice air-conditioned museum or a walk through a shaded garden? The July program listings have it all. In other Ephrata news, the Ephrata Cloister Associates are offering a day-long bus trip to New York City on Saturday, August 1, to explore the immigrant experience. Tour Ellis Island and the Tenement Museum, with stops at Chelsea Market and the High Line in between. 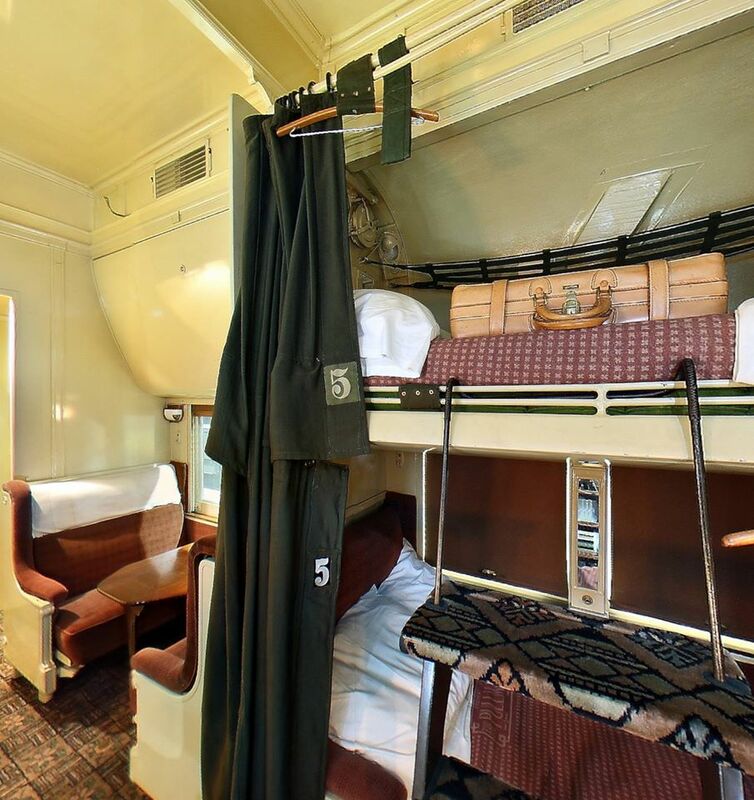 Cost includes bus, entrance fees, guides, and an after-hours reception at the Tenement Museum. Find out more on Ephrata's website or register for the trip via Eventbrite. Somerset Historical Center just opened a new exhibit, "The Barn: Icon of Somerset County Rural Life." The exhibit, which runs through October, explores the design, construction, and use of barns throughout county history. This is particularly timely, since the PA General Assembly has designated 2015 as The Year of the Pennsylvania Barn. 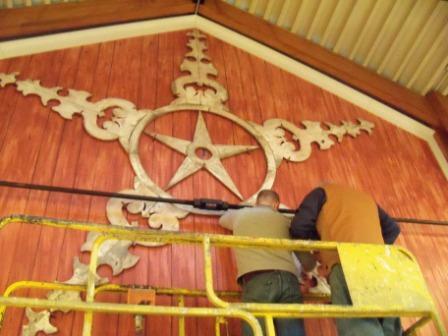 Earlier this year, museum staff installed a Somerset County barn star outside the changing exhibit gallery. Three new behind-the-scenes tours have debuted at the Railroad Museum of PA. Available by advance reservation only, these tours provide guided access to areas that are generally off-limits to visitors. They require an additional fee beyond general admission; proceeds help to support the museum's preservation efforts. More info and instructions on how to book your spot are on the website. For those of you who enjoy the Twitter, please mark your calendars for this year's #AskACurator day, Sept. 16. PHMC curators participated for the first time last year and we hope to have an even more stellar line-up this year. We'll provide more info as plans are formulated. In the meantime, be thinking about what you want to know about our sites, especially the numerous and varied collections we care for. So much to do on the Trails of History this month. Be sure to check out the July program listings to make your plans. Remember, July is National Anti-Boredom Month. Only you can prevent boredom, but we can help. 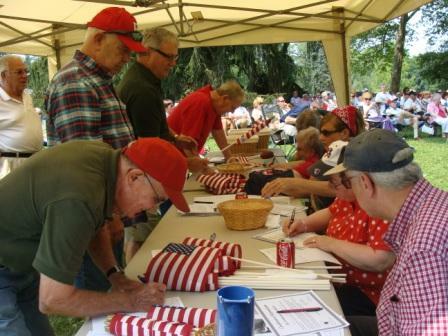 Independence Day Weekend was abuzz with activity on the Trails of History. 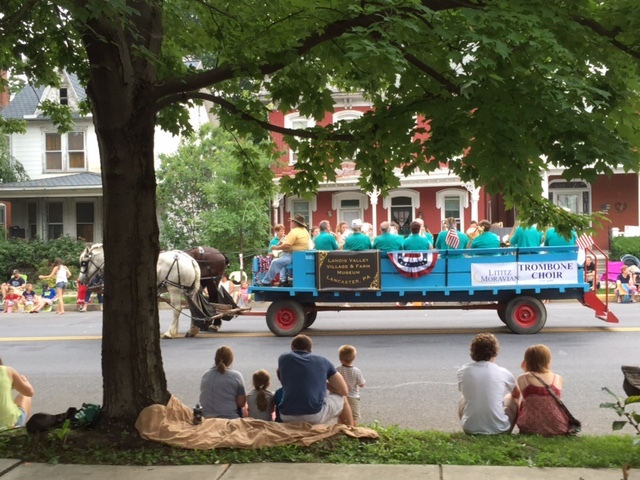 On July 3, a team of horses, driver, and wagon from Landis Valley Village and Farm Museum provided transportation for the Moravian Trombone Choir during the (nearby) Lititz parade (photo below by AKF). On July 4, visitors to Washington Crossing Historic Park enjoyed military demonstrations, a reading of the Declaration of Independence (Andrea Pearlman Richards shared her photo to the Crossing's Facebook page), and the christening of a newly restored replica Durham boat. The Pennsylvania Military Museum offered one of its Kids Day programs, where children can try on military items from the education collection. 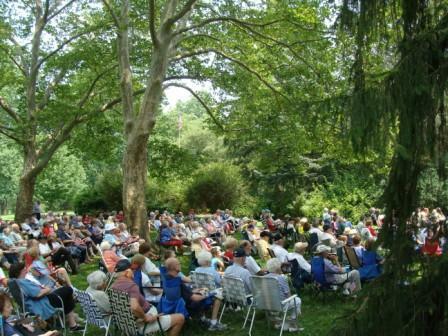 It was a beautiful Sunday at Conrad Weiser Homestead on July 5 for the annual Patriotic Concert, which featured the famous Ringgold Band. Over 100 veterans signed in, each receiving an American flag and a certificate; all names were read as part of the program. In total, more than 450 people were on hand for the event. 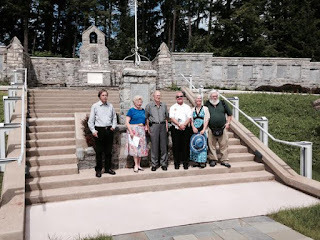 In late June, representatives of the United States World War One Centennial Commission visited the State Museum, the State Archives, and the Pennsylvania Military Museum. Among other activities the Centennial Commission is partnering with Saving Hallowed Ground to document existing monuments related to "The Great War," while their mission also includes the development of a national WWI memorial. During this centennial period (2014-18), the Military Museum has increased their attention to Pennsylvanians' experience in WWI (already a substantial part of the museum's focus), and the PHMC has a committee working on commemoration of both World Wars (2016 is the 75th anniversary of U.S. entry into WWII). Archaeological excavations have been going on this summer at Eckley Miners' Village, focused on what is known as the back street, home to the least well-paid workers. The work at Eckley is an extension of the Lattimer Archaeology Project, under the auspices of the Dept. of Anthropology at the Univ. of Maryland. The crew have found a number of interesting artifacts that shed light on the daily lives of mining families. During this year's Patch Town Days event, which was pretty rainy, they shared info with visitors and welcomed them into the on-site lab where they are processing the artifacts unearthed. To learn more about the Eckley dig or the earlier work in nearby Lattimer and Pardeesville, check out the Lattimer Archaeology Project blog. The Bucks County Courier Times shared video of Pennsbury Manor's first week of Colonial Camp, and it looks like fun. If you're in the area and missed it this week, Time Traveler Camp (for grades 5-7) starts this Monday, July 20, and Colonial Camp II (for grades 1-4) starts July 27. Be sure to check out the July program listings for events and activities on the Trails of History this month. Today's post comes from Ryan Zsifkov, currently studying at East Stroudsburg University for a master's degree in history (he holds a BA in history (minor in anthropology) from Penn State). Ryan is serving an internship at the PA State Archives as part of the PHMC's Keystone Summer Internship Program. Thanks, Ryan, for sharing your research with Trailheads readers. 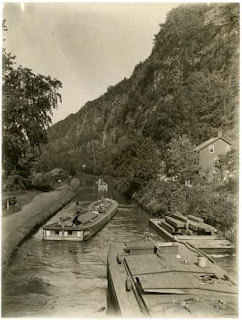 The Pennsylvania Canal, a mostly forgotten piece of history, was at one time a significant component of the Commonwealth’s economy and an essential mode of transportation throughout the state. Spurred onward by competition from New York and the forward-thinking imagination of Pennsylvanian leaders, merchants, and industrialists, the Pennsylvania Main Line Canal was in existence for nearly seven decades before falling into disuse in the latter half of the 19th century. In 1817 the State of New York began a revolutionary project to connect its eastern ports and the Hudson River with Lake Erie and Buffalo in the west. The Erie Canal heightened fears among many Pennsylvanian merchants that New York would become even more prosperous and appealing and would threaten commerce in Philadelphia. 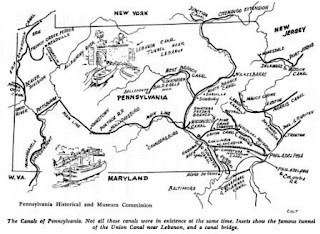 Pennsylvania responded by building the Pennsylvania Main Line Canal, which connected Philadelphia in the east to Pittsburgh in the west. This enormous undertaking was completed in several sections, requiring a substantial investment of capital from the Commonwealth. By 1834, after decades of planning and construction, the canal was in use transporting millions of pounds of goods along its scenic routes throughout the state. Using waterways as a mode of transportation was not a new idea. In fact, William Penn had proposed using them when he had the Philadelphia region surveyed for settlement, choosing the city's location at least in part to be near the Delaware and the Schuylkill. Prior to the Main Line Canal smaller companies had built an increasingly intricate system of canals throughout the state, but most only connected relatively local waterways. 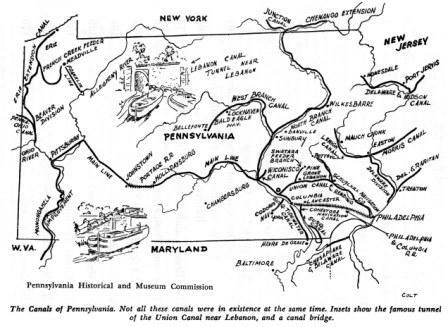 The Pennsylvania Main Line Canal connected the east to the west, allowing goods from the ports in Philadelphia to be easily distributed throughout the State and to travel as far as Pittsburgh. 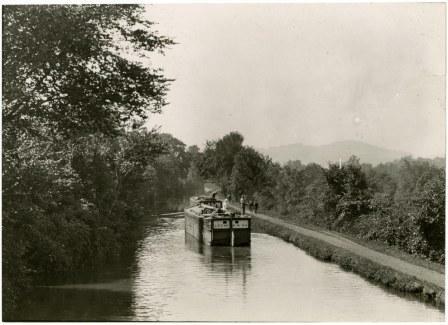 The Commonwealth's rugged terrain and rivers presented obstacles throughout the construction of the Main Line Canal. A complex array of locks and gates were constructed, similar to those already in use in England and elsewhere in the United States. A standard lift-lock had gates on either end. When a boat approached needing to move from lower to higher elevation (for example), a sluice gate opened to drain water from the lock chamber to the level of the water on which the boat was floating. The lock's lower gate opened to allow the boat to enter and then closed behind it. The water level in the lock chamber was then raised to the level of the water in front of the upper gate and the gate would open, freeing the boat at the higher level. [Editor's note: the website for the Schuylkill Canal Association has an animation of how locks work.] Creeks and other waterways that presented obstacles were bridged via aqueducts and culverts. 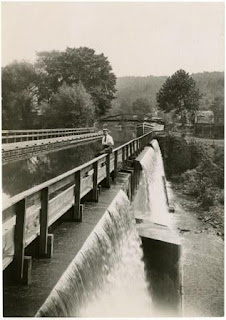 To maintain an adequate supply of water to the canals numerous dams were constructed on the rivers feeding into the canal. 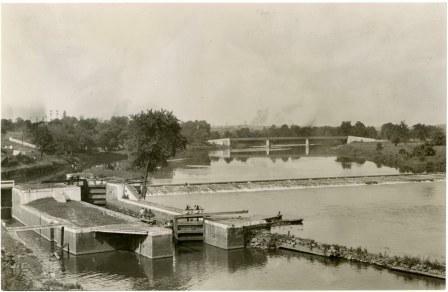 In areas where there were great distances between two lift-locks, stop-locks were constructed to halt the flow of water so that sections could be drained for maintenance to keep the canals operable. Millions of dollars were spent on maintenance for the lift-locks, aqueducts, feeders, dams, bridges, and workmen’s wages. By the end of the 19th century canals had been mostly displaced by the railroads. Many of them were bought out by railroad companies and fell into disrepair. As the Pennsylvania Railroad expanded, the cost of maintaining both the rail lines and the canals became far too great. The beginning of the end for the canals came with the widespread use and increased manufacturing of steam locomotives. Increasingly efficient locomotives took much of the trade from the canals; by 1890 all but approximately 144 miles of Pennsylvania’s canals were abandoned and left to succumb to the forces of nature. The Pennsylvania Canal was once one of the most impressive and intricate networks of its kind in the United States; in its heyday it was integral to both intrastate and interstate commerce. With 19th-century pick axes and tools Pennsylvanians labored tirelessly to complete approximately 1,250 miles of canal waterways. Today very few remnants of the canals remain; however if you are willing to trek off the beaten path and know where to look the remains of old gates and lock houses can still be found. As you drive along the many highways and back roads throughout the Commonwealth be sure to keep an eye out for historical markers indicating the locations where the iconic Pennsylvania Canal once stood. Coming to you a day early this week to help you make your plans for National Anti-Boredom Month. Many sites on the Trails of History will be open on the 4th, but please check out the list to be sure the site you want to visit is on it. We had a post a couple of weeks ago about summer camps at PHMC sites, so there's only a brief listing below with a link. There's no excuse for not fighting boredom this month or any other! We can help. Saturdays: South Side Farmers Market at the Scranton Iron Furnaces. 10 am-2 pm. July 14-17: Children's Summer Camp—More info. Through August 7: Summer History Camp—More info. July 12: 11th Annual 5K Trail Run/Walk—Bushy Run is the site for this annual event benefitting the Penn-Trafford Area Recreation Commission (PTARC); visit PTARC's website for registration info or pick up a form at the Bushy Run Battlefield Visitor Center. July 19: 5th Annual Classic Car Cruise—classic and custom cars, live music, food, drink, and more. Event is free; regular admission applies to visit the exhibits. 11 am-4 pm. Site open Wednesdays, 10 am-4 pm; Saturdays, 10 am-4 pm; Sundays, noon-4 pm. July 5: Patriotic Concert in the Park—this annual event honors all military veterans. Admission and parking are free, contributions are gratefully accepted. Please bring your own chairs or picnic blankets. 1:30 pm. July 12: Weiser Interpretive Sunday—enjoy a summer afternoon at the homestead learning about life in the Tulpehocken. Noon-4 pm. July 5, 12, 19, 26: Interpretive Sundays—spend summer Sunday afternoons learning about 18th-century military life (July 5), gardening (July 12), leatherworking (July 19), and 18th-century games (July 26). Included in regular admission. Noon-4 pm. 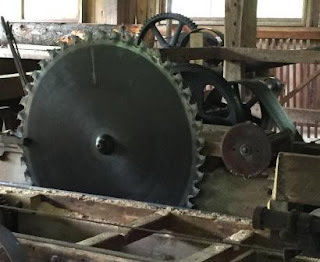 July 8, 15, 22, 29: Sawmill Operation Days—subject to staff availability, there will be two half-hour demos of the reconstructed sawmill on Wednesdays in July. Call 610/582-4900 to confirm. Demos are free; regular admission charged for guided and self-guided tours of the historic area. 11 am and 2 pm. July 13-17: History Day Camp—More info. July 11: Something More Saturday—in addition to the regular offerings, today the Mobile Energy Education Training Unit (MEET-U) will be on the scene. Included in regular admission; special family rate of $20 for up to 2 adults and 3 children. 10 am-3 pm. July 13-17: "It's All About Oil" Day Camp—More info. July 25: Blacksmith Demonstrations—monthly demonstrations take place the last Saturday of the month through October. Included in regular admission. 10 am-2 pm. July 26: Vintage Baseball and Ice Cream Social at Pithole—the Pittsburgh Franklins take on Somerset County's Frosty Sons of Thunder playing by 1860s rules. Admission charged. Site opens at noon, first pitch about 1 pm. July 25-26: 1940s Weekend—an overview of the WWII era in a coal mining town. Military and civilian reenactors will be on site, and there will be music and food. A swing-era USO Dance will be held off-site the evening of July 25. Visit the website for details. 10 am-5 pm both days (dance is at 6 pm on Saturday). Registration is open for August 1 bus trip to NYC. "Viewing the Immigrant Experience" will take you behind the scenes at Ellis Island and the Tenement Museum, with stops in-between. Cost is $175 per person; tickets available via Eventbrite or by contacting Andrea Glass (c-aglass@pa.gov or 717/733-6600). July 14-17: Colonial Summer Camp—More info. July 4: Friends and Family Day—hands-on activities for the kids, free admission to the museum and tours of the ship, a free hot dog (while supplies last), and fireworks. 9 am-5 pm (kids' activities 11 am-3 pm). July 13: Monday Night Movie at the Maritime—Tonight's feature is "Master and Commander"; Niagara's sails serve as the screen. The movie and the popcorn are free. Film begins at dusk; doors open at 9 pm. July 20: 4th Annual Flagship Niagara Open—details and registration are on the website. Part of your registration fee is deductible and supports the Flagship Niagara League's programs. July 27: Storytime at the Maritime and Monday Night Movie at the Maritime—Storytime, geared to ages 3-7, features a nautical-themed book and related activity. Program starts at 10 am and is free. Tonight's maritime-themed movie is "Finding Nemo"; Niagara's sails serve as the screen. The movie and the popcorn are free. Film begins at dusk; doors open at 9 pm. July 4: Fourth at the Fort—help staff and volunteers raise the flag and sing the national anthem. Check the website for details. 11 am-noon. July 11, 18, 25: Saturdays at the Fort—living history activities will include: artillery (July 11); cooking (July 18); and blacksmithing (July 25). 10 am-4 pm. July 19: Site is open—visit the grounds and take a guided tour of the mansion (at 1:00 or 2:30 pm). Admission is $5 for adults, $4 for seniors and ages 6-17, free for age 5 and under and Friends of Hope Lodge. 12:30-4 pm. July 22-24: History Camp—More info. July 14-17: Historic Trades Camp—More info. July 18: Old Fashioned Picnic—food, games, music by the New Holland Band, and a parade of horse-drawn vehicles in the setting of a 19th-century village. There will be hot dogs and freshly churned ice cream for sale or you can bring your own picnic. Included in regular admission. 10 am-4 pm. July 25-26: Civil War Weekend—the site is transformed into a rural Pennsylvania village during the Civil War, with reenactors portraying soldiers and civilians (detailed schedule for both days). Included in regular admission. Be sure to check out the visitor center exhibit, "1865: Lancaster County at the Close of the Civil War." Food (and lots of other great stuff) will be available for purchase at the Museum Store. 10 am-4 pm. July 3-4: Site closed July 11, 18, 25: 19th-Century Trades and Crafts—each Saturday has a different focus: gardens (July 11); textiles (July 18); and decorative arts (July 25). Included in regular admission. 11 am-4 pm. July 20-24 and July 27-31: Summer Camp—More info. July 5, 12, 19, 26: Special Sunday Programming—something different every week: meet the blacksmith and the joyner (July 5); meet the residents of Pennsbury (July 12); meet the cooks (July 19); meet the gardeners and brewers (July 26). Included in regular admission. 1-4 pm. July 13-17, 20-24, 27-31: Colonial Camp and Time Traveler Camp—More info. 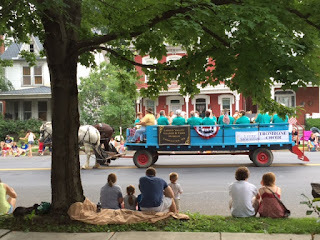 July 4-5: 41st Annual Bark Peelers’ Festival—this hugely popular event recreates the 4th of July celebrations of Pennsylvania’s early 20th-century lumber camp workers and “woodhicks.” Details are available on the website, and you can also see photos from previous years. Admission: $10 (age 12+), $3 (age 3-11); 2-day pass, $18. July 4: Kids Day II and Lecture/Book Signing—kids (of all ages) can try on uniforms from the museum's education collections and learn about soldier life; photo ops abound. 10 am-3 pm. At 1:30 pm, local author Daisy Reiter will read from her book, Cora, It's War, about a little girl's experiences growing up in Pennsylvania during World War II. Both included in regular admission. July 7: Central PA Civil War Roundtable Series—author and NPS interpretive ranger John Hoptak will present "Before the Crater: The 48th Pennsylvania Volunteer Infantry at Petersburg, June 1864." His focus will be the Schuylkill County anthracite coal miners who dug a tunnel beneath Confederate defenses east of Petersburg, Virginia. Donation requested. 7 pm. July 18-19: VIETNAM Revisited—living historians portray American combat and support troops “in country” in the late 1960s; visitors have the opportunity to accompany (living history) squads on short range patrols. (Photos from last year's event are on the website.) 10 am-4 pm (tactical demo at 1:30 pm each day). July 24: Registration deadline for Boot Camp for Kids—More info. Through July 5: Reading Railroad Days—offered in conjunction with the Reading Company Technical & Historical Society, this program features an enormous HO-scale model railroad and highlights Reading Company rolling stock in the Museum’s collection. Details are on the website. Included in regular museum admission. July 13-17, 27-31: Barons and Builders Day Camp—More info. July 18: Exhibit opening—"The Barn: Icon of Somerset County Rural Life" explores the design, construction, and role of the classic barn (timely in this the Year of the Pennsylvania Barn). Runs through October. Included in regular admission. July 26: Somerset County Appreciation Day—Somerset County residents are invited to come and enjoy an afternoon of local history as they explore a historic site in their own backyard. Free admission. Noon-4 pm. Throughout the month—"Learn@Lunchtime" and "Meet the Experts" programs will explore the history of the State Museum and Archives Complex and the Museum's new Nature Lab (details on the website). July 16: Story Time in Curiosity Connection—featured book is Number One Sam, by Greg Pizzoli. Included in regular admission. 10 am. July 4: Independence Day Celebration—Living history demonstrations, a military encampment, and tours of historic buildings. There will be a reading of the Declaration of Independence at noon and the christening of a replica Durham boat at 12:30 pm. Food will be available for purchase. Admission: $8 (age 12+), $4 (age 5-11). 10 am-4 pm. July 24: Films at the Farmstead—a family-friendly movie night under the stars at the Thompson-Neely House and Farmstead. Tonight's feature is "Big Hero 6." Admission is $5 (age 5+); please bring a blanket to sit on and feel free to bring a picnic. Movie starts at dusk.